"The shift in demographics and new technologies have a profound impact on the distribution of incomes and wealth." Economic growth is slowing and public debt remains high across the world. Meanwhile, demographic changes and technological advances are reshaping the global economy. Everyone’s opportunities for a good education, along with their job prospects, healthcare, and retirement income depend on the tax and spending choices governments make as they respond to these challenges. In the new Fiscal Monitor, we argue that they can take a long-term view to foster higher and more inclusive growth. This means getting their fiscal houses in order by gradually lowering debt to prepare for the next downturn and upgrading fiscal policy to invest in people’s futures. This requires better allocating spending, creating more room in the budget, and improving tax policy. High debt can handicap policymakers’ ability to increase spending or cut taxes to offset weak economic growth, as creditors may be less willing to finance larger budget deficits. Interest payments on debt also crowd out spending on education, health, and infrastructure, which are all investments that help a country grow for many years to come. Each country will have to identify an appropriate strategy to make room in its budget to help the economy during the next downturn. Countries with high debt will have to increase revenues or curb excessive spending. This is especially relevant where current economic growth exceeds long-run potential growth, as in the United States, or where borrowing costs are high and financing needs are large, such as in Brazil and Italy. Yet, these countries should maintain investments in education, health, and infrastructure, either by reprioritizing spending or broadening the tax base, for example, by removing tax exemptions and improving tax administration. Where financing is less of a concern, such as in Germany and Korea, policymakers could increase investment in infrastructure or education to support the economy in the near term, and foster inclusive growth over the next few decades. Fiscal policy must also look beyond preparing for the next economic downturn. The shift in demographics along with new technologies are having a profound impact on economic growth and the distribution of incomes and wealth. These trends also impact public finances. For example, in advanced economies, whose populations are rapidly aging, we project that age-related public spending, such as pensions and healthcare, will consume a quarter of GDP by 2050. Conversely, emerging market and low-income developing economies’ populations are much younger and growing fast. To make progress toward achieving the UN Sustainable Development Goals on infrastructure and public services, these countries will require additional public spending. What can countries do to adapt to these global trends and reduce their debt? They can pursue smarter and more agile policies to facilitate change. This means upgrading fiscal policy on three fronts. 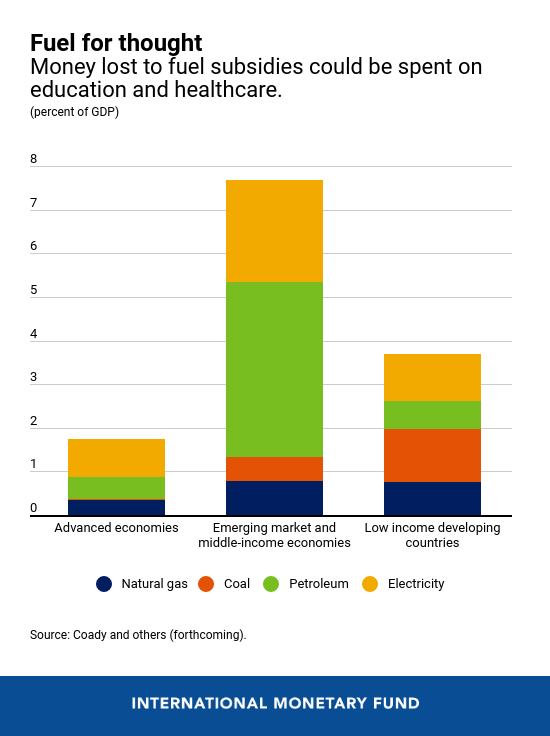 First, countries should shift spending toward growth-enhancing investment in infrastructure, education, and healthcare, while cutting wasteful spending, such as inefficient energy subsidies. For example, gradually removing fuel subsidies, while protecting the most vulnerable, could provide up to 4 percent of global GDP in additional resources for countries to invest in people and growth. Focusing more on policies that foster lifelong learning and continuous upgrading of skills are also important in a more digital and automated world. For example, Singapore offers training grants to all adults throughout their working lives, and the Netherlands offers tax deductions for workforce training. Curbing corruption would also help raise additional resources and reduce waste, as we show in Chapter 2 of the Fiscal Monitor. Second, steps to improve public financial management and raise revenues could create more room in the budget. In advanced economies, better management of government financial assets could yield up to 3 percent of GDP a year in additional revenue, as shown in the October 2018 Fiscal Monitor. Emerging market and low-income developing economies should raise their revenue collection. 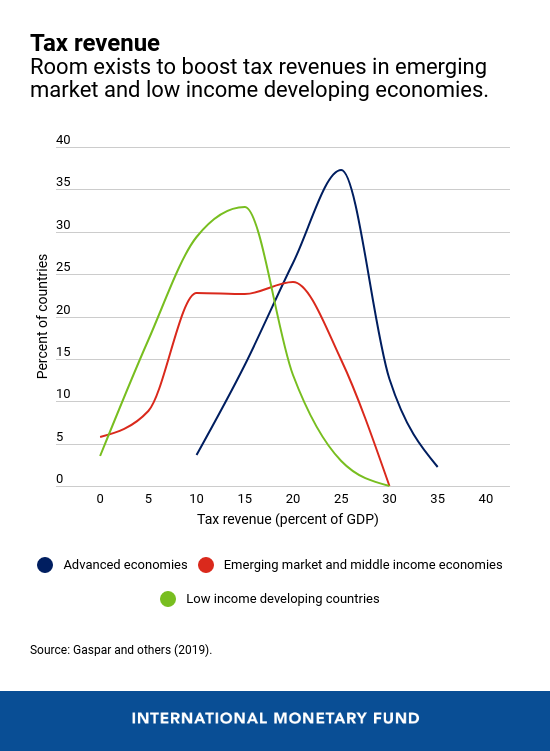 For example, sub-Saharan African countries could raise, on average, 3 to 5 percent of GDP in additional revenue over the next five years if they improve the efficiency of their current tax systems. Third, advanced economies should return to more progressive income taxes, which will help reduce inequality. Most also have room to raise revenue significantly from taxing inheritances, land, and real estate. Also, governments should cooperate to reform taxation of large multinational corporations, in particular digital ones. This would help raise revenues, including for low-income developing countries, by limiting profit-shifting and global tax competition. These actions would help raise long-term economic growth, which is a key ingredient to reduce the burden of high public debt. They would also spread economic benefits more widely within and across countries, and restore the public trust in institutions necessary for economic stability. This article is published in collaboration with IMF Blog.